When your thirty-one year-old wife and the mother of your two young children dies of brain cancer after countless prayers from hundreds of believing friends, what difference does it make to ask Jesus into the despair? When your one year-old has to undergo physical therapy, and the treatment you inflict on your baby makes him scream in pain every day for months, what difference does it make to invite Jesus into that pain? When your dark tunnel of depression has become darker, narrow, with no end in sight and the in-breaking shafts of light mostly memory, what good does it do to invite Jesus into your desperation? If he is our God and could change really, really tough circumstances but will not, what good does it do to do life with him? In my ongoing effort to demonstrate my spiritual superiority and make most of you feel guilty, I’m going to talk about my morning devotional. For no one can lay any foundation other than the one already laid, which is Jesus Christ. If any man builds on this foundation using gold, silver, costly stones, wood, hay or straw, his work will be shown for what it is, because the Day will bring it to light. It will be revealed with fire, and the fire will test the quality of each man’s work. If what he has built survives, he will receive his reward. If it is burned up, he will suffer loss; he himself will be saved, but only as one escaping through flames. Occasionally I’ve heard the question asked, “Will Christians go through the Last Judgment?” It seems to me the answer is right here. Christians will be judged, but only in terms of rewards, not punishment. Paul imagines—or perhaps he once observed—a man going through the ruins of his house after it has burned down. The man sifts through the ashes, recognizing charred scraps of clothing or sticks of furniture, ruined forever. But in the cinders he touches something heavy and solid. He lifts it up. It’s his savings—a bag of coins. The bag itself has burned up, but the money comes up all together in a lump, because it’s gold and silver. It’s melted together, but it’s all there, and just as valuable as it was before the fire. Because gold and silver are invulnerable to flames. That’s how it will be at the Last Judgment, Paul is saying. It won’t be like the Muslim Last Judgment. Muslims believe that everyone—Muslim and infidel—will stand before the same court. There will be a balance scale there. On one side of the balance, all the person’s good deeds will be placed. On the other side all his sins will go. If the good is heavier than the bad, the person goes to Paradise. If the evil weighs more, he goes to Hell. Thus no Muslim is ever entirely sure of salvation (unless he’s a martyr, of course). I suspect a lot of people who think they’re Christians are actually Muslims, at least in this doctrine. But Paul says that as long as you stand on the Foundation—that is, Jesus Christ—you can’t be condemned in the Judgment. Your deeds, though—all the stuff you bring with you from your life—your achievements and piety—all that will go through the fire. When the fire has had its way, you’ll see (and I’ll see) how much of that was gold, how much was kindling. A comforting thought, and a troubling one, all at once. I should practice sleeping out of doors, I think. A lot of people have a lot invested in the belief that Jesus Christ was merely a great human teacher, about whom fantastic but fictitious tales were spread after his death. This view permits such people to consider themselves “Christians” in the sense of being followers of “the real Jesus” (about whom, according to this theory, we really can say nothing for sure, but they’re sure they know what He truly meant anyway, and—what do you know? It’s precisely what they already think!). Most importantly it avoids the whole scandal of the Cross thing, which is so tacky. And that, in short, is what I think of James Cameron and his documentary on Jesus’ tomb. I move right past discussion of his claims and settle on an ad hominem attack. But if you want a discussion of Cameron’s arguments, I recommend to you this post at Dennis Ingolfsland’s Recliner Commentaries blog, a blog that deserves to be better known than it is. For a more sinister, humorous take I liked what Dirty Harry wrote yesterday at Libertas blog. I got a call Saturday night that church would be cancelled. This did not break my heart, because (mea culpa) I go to church out of obligation, not desire. Suffering as I do from a psychological condition clinically known as “being nuts,” I don’t enjoy gathering with other people much. A guilt-free Sunday morning off does not cast down my heart. I was in the basement Sunday morning when I noticed my neighbor’s wife through the window above, shoveling our shared driveway. This was curious, since my neighbor has a snow blower. He keeps it in my garage, and the deal is that in return for that accommodation he clears my side as well. I could have pretended I hadn’t noticed, but I decided to pretend to be a responsible adult. I went out and grabbed my shovel. I found my neighbor out there too. He explained that the blower had a flat tire. 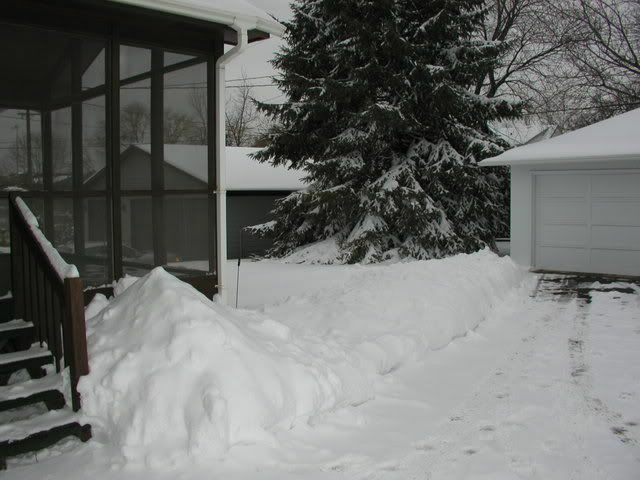 So I pitched in and we managed to clear adequate paths. This is the kind of work where overweight, middle-aged men tend to fall over with heart attacks, but I dodged the bullet. The snow in the picture, I can tell you with absolute moral authority, is wet and heavy. This was, in fact, the heaviest snowfall our metropolis has experienced in several years. I think there’s a sense of satisfaction all over our fair state today, a grin behind the grumbling. With a few hiati, this winter has been pretty easy so far, and that’s bad for our self-image. Minnesotans think of themselves as the hardy folk who thrive in arctic conditions for half the year and like it—yes, like it, by golly! In our secret hearts, we think it makes us better than folks who live in easier climes. Now we’ve earned a little cred back, and we’re swaggering a bit. I think I’ll swagger over to the thermostat and turn it up. Sorry for the late posting. My wireless connection chose this evening to forget its way home, and all my blandishments and caresses were of no avail. Now suddenly, having come back upstairs from my shield project (of which more below) I find the necessary light back on again, and I’m able to resume communication with you, the Esteemed Reader. I wanted to call Earthlink Customer Support about the problem, but I had to leave the phone line open, as a guy had made an appointment to come over and look at the room for rent tonight. Or rather, he was going to call to get directions tonight, and then come over. But so far, no action on that front. I have a suspicion he’s going to stand me up. Which is only justice, in the greater scheme of things. I remember a couple times I did the very same thing to landlords, in my youth. When I’d decided not to check a place out, I never had the nerve to phone and tell the manager personally. Avoidant stuff. 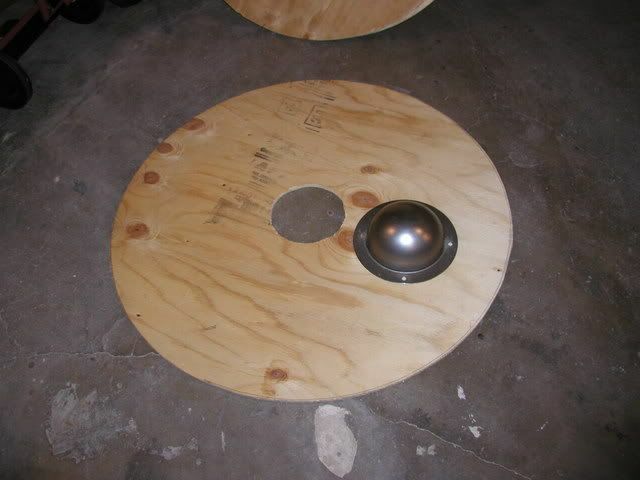 But I was itching to finish painting my shields tonight, so I finally went down to the basement and worked on that, with the door open so I could hear the phone (haven’t got one down there). I’m not entirely happy. I’d like bolder colors—ideally I’d have preferred the bright red and yellow I usually paint my Viking stuff with. But I’m trying to conform to the general standards of the big-time re-enactors, and they prefer muted colors, because bright was hard (and expensive) to do a thousand years ago. So I took somebody’s advice and went to a paint store and looked for “mistints,” which sell cheap. These were the most interesting colors I could find, but the reddish thing is almost pink, and it underwhelms me. I’ll live with it, though. Better this than have an English re-enactor (should I ever chance to encounter one) get in my face. The design, by the way, is based on the heraldic device of the island of Karmøy, where my great-grandfather was born. We’re supposed to get a big snowstorm tonight, which will continue on through Sunday. If you don’t hear from me again, it’s because I starved or froze. Or because my wireless has gone out again. I think I may have had the flu last night. I’m not really sure. As I was IMing with someone last night, I began to feel tired and physically weak. I told my friend I thought I might be getting sick. Flu maybe. This morning I got up and felt fine, but later in the morning I had a bout of what I’ll delicately call “intestinal distress.” But when that was done, it was over. Maybe it was something I “et,” but I’ve noticed a pattern in the last few years. I’ll feel like I’m coming down with something in the evening, but after a good sleep I’m fine. I’m coming to believe that I’ve developed a superhumanly strong immune system. When I was a kid I got sick a lot. When I grew a little older I got sick less often. Now that I’m entering my golden years, I don’t seem to ever get sick anymore. I know a guy my age ought to get flu shots, but I’m kind of scared of upsetting this remarkable balance I seem to have achieved. It’s a strange time in the library these days, for me. I’ve been given a new assistant, and I’m not sure how it’s going to go. The new assistant is a short-term seminarian from Africa, an elderly pastor so far ahead of me spiritually I can barely make out his silhouette on the distant horizon. We like to give our foreign students part-time jobs on campus, because they usually don’t have the option of driving. I imagine the Higher Powers decided to send this pastor to the library because they figured the library is a light job. It’s light in terms of lifting (mostly), true enough. But I fear that this pastor may be finding it pretty heavy in emotional terms. He has almost no experience with western technology. He’s never used a computer in his life. The control of a mouse is an extremely frustrating exercise for him, much as learning to operate a video game controller would probably be for me. Even the electronic typewriter we type check-out cards with frustrates him. I hope it’s not keeping him awake at night or anything. I hope I’m a patient trainer. Culture Shock is my middle name. Or middle names. Another beautiful day, the last for a while. Tomorrow will be colder, and there may be snow over the weekend. Hope I can finish this and get it posted before I leave for church. I’m reading Scripture tonight, and that’s one of the few things I’ll confess to being good at. Will Duquette of View From the Foothills sent me the following meme. Memes are easier than thinking of something to write about. 1. What is your occupation? Librarian/Bookstore Manager. 2. What color are your socks right now? Black. 3. What are you listening to right now? Hugh Hewitt on the radio. 4. What was the last thing that you ate? A Banquet turkey TV dinner. 5. Can you drive a stick shift? Yes. 6. If you were a crayon, what color would you be? I’d be tan, but I’d wish I were red. 7. The last person you spoke to on the phone? A woman who’d called about my room to rent for herself and her husband (I told her I thought it would be a little crowded). 8. Do you like the person who sent this to you? So far as I know him online. 9. How old are you today? 56. 10. Favorite drink? Diet Orange Sunkist soda. 11. What is your favorite sport to watch? Live steel combat (participation is better). 13. Allergies? Adhesive bandage tape makes my skin turn red. Other than that, nothing. 14. Favorite foods? Roast turkey, pizza, steak, hamburgers. Chocolate. 15. What was the last movie you watched? Stranger Than Fiction. 16. What do you do to vent anger? I don’t. I stuff it. 17. What was your favorite toy as a child? Toy guns. 18. What is your favorite season fall or spring? Spring. 19. Hugs or kisses? I don’t get either. 20. Cherries or Blueberries? Cherries. 21. Do you want your family and friends to email you back? Does not apply. 22. Who is most likely to respond? DNA. 23. Who is least likely to respond? DNA. 24. Living arrangements? I live in a house by myself, until I get a renter. 25. When was the last time you cried? Don’t recall. 26. What is on the floor of your closet? Shoes. Boxes. Dust. 27. What did you do last night? Walked, blogged, straightened the living room, worked on an opinion piece for Hunter Baker. 28. Favorite smells? The sea. Popcorn. Roasting meat. 29. What inspires you? Sublime music. 30. What are you (most) afraid of? Rejection and humiliation. 31. Favorite dog breed? Not sure. But something large. 32. Number of keys on your key ring? Eight on the main one. 33. Favorite day of the week? Sunday (specifically Sunday afternoons). 34. How many states have you lived in? Five. Minnesota, Iowa, Missouri, Wisconsin, Florida. 36. Ever driven a motorcycle or heavy machinery? No. I tried a motorcycle once; nearly had an accident. In somebody’s yard. 37. Ever left the country? Yes. Mostly to Norway. 38. Favorite kind of music? British folk music, classical, Ennio Morricone spaghetti scores. 39. Last book you read? The Two Towers. The temperature was up around forty today. In Minnesota, in February, that counts as a beautiful day. The sun shone, and our thin snow cover faded like the new congress’s gravitas. I even had time for a walk before sundown, though evening shadows were lengthening by the time I finished. As an added bonus, somebody had left a bookcase out in front of their house, with a “Free” sign taped to it. I jumped into Mrs. Hermanson, drove back and snagged it. It’s kind of beat up, granted, but I meant it for the basement. I can never have enough bookcases. S. T. Karnick has been relentlessly asking hard questions about the Tim Hardaway controversy. I’m not sure I agree entirely with his position, but I’m not sure I entirely agree with my own either. Assuming I have one. When I was young I came to embrace a passionate, Jeffersonian view of freedom of speech. I believed the American approach was essentially based in a Christian world view. If everybody, regardless of how outrageous his opinion, is permitted to make his case the best he can, the marketplace of ideas will make the truth evident to all, because there’s power in Truth. However, there’s another way to look at it, also based in a Christian world view. That approach would say that, since human beings are sinful and essentially perverse, they will always choose the answers they find most convenient, flattering and profitable, regardless of the merits of the arguments. Which is precisely what the left is doing with Hardaway. So I ought to be OK with that. But I can’t dismiss Karnick’s argument that it’s pretty hypocritical for people to self-righteously pretend they don’t share Hardaway’s feelings to some extent, and to justify themselves by throwing stones at him. I’ll let you know if I come to any conclusions. The classical world is one of arduous work but also miracles of artistry. Every year brings child prodigies wise beyond their years. Meanwhile, the demise of major classical recording labels over the last decade has given rise to an uncountable number of independent labels. Among the many musicians turned out each year by the world’s conservatories, the unknown ones who record for such operations are often as talented and distinctive as those who fill seats at Carnegie Hall. So writes David Patrick Stearns in today’s Philadelphia Inquirer, “Ears don’t deceive – the CD covers do.” Partly for these reasons, the husband of a recently deceased pianist was able to republish under her name excellent concertos by musicians who were not readily known. When one critic put one of Joyce Hatto’s discs into his computer, it told him the performer was Laszlo Simon. You can read how that happened and exactly how the hoax of the greatest pianist of our time is currently unraveling on ClassicsToday.com. They tell me that, Dennis Prager’s curmudgeoning to the contrary, today is not legally President’s Day, but Washington’s Birthday. “Presidents Day” is just what the stores call it. I’m not sure why. “Washington’s” is twelve letters, if you count the apostrophe, and “Presidents” is ten letters (eleven if you add an apostrophe, which isn’t strictly necessary), and that’s not going to make much difference to your ad copy column inches costs. Let’s see, what do I know about Washington that doesn’t call for a lot of research on a holiday that’s mostly already over as I write? Washington’s ideal—the model that inspired him—was the farmer-statesmen of the Roman republic. Those guys who reluctantly left their fields to shoulder the burden of civic responsibility for a time, then joyfully laid it down again to go back to their real lives. You can see echoes of that pattern everywhere in the great man’s career. Even the architecture at Mount Vernon was a statement of this ideal. In contrast to the Greek Revival architecture favored by Jefferson and his crowd, Mount Vernon is Roman to the foundations. He wasn’t a fun guy, Mr. President Washington. He was “on” all the time, playing the role, conscious that he was setting a benchmark by which his successors would be expected to measure themselves. 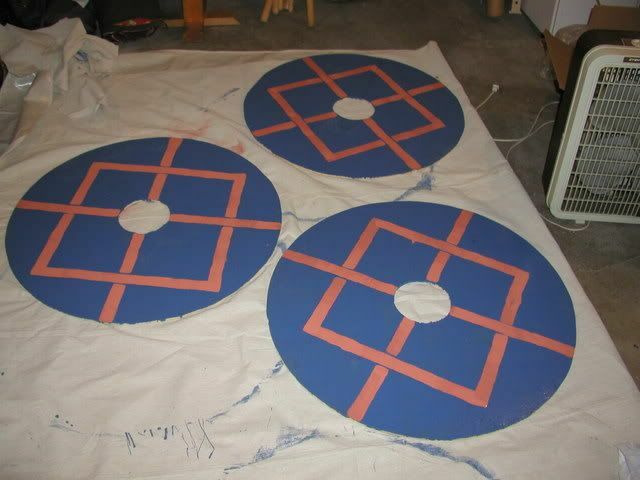 I spent my weekend working on my new Viking shields for live steel. I’ve got three rounds like this now, and I drilled holes in the two bosses (the boss is the bowl-like metal thing there). One round will be a spare, for when one gets shattered (which will definitely happen). The great challenge was getting a 4×8’ sheet of 3/8” plywood home from Home Depot. First I drove around trying to find an auto parts store that sold clamp-on car top carriers. Turns out nobody carries them anymore. Then I figured, well, if you take an old blanket to protect Mrs. Hermanson’s roof, you can just buy some tie-downs at the store and strap ‘er on and drive home that way. Which is what I did, but it took a while. We had a stiff wind (pretty cold too) that wanted to blow the blanket off, so I had to bungee that down first. Then I got the plywood sheet up and discovered that Mrs. Hermanson, being one of those SUV’s built without a top rack, is specially designed for the frou-frou set, having no projections or inlets of any kind to which a conventional tie-down may be attached. I finally got the tie-downs hooked into the window channels, but only in the same way that you can chin yourself up on the molding on your living room wall. I was also concerned that the front of the panel would get lifted by the wind as I drove. I was just starting to unfasten everything and see if I couldn’t fit the thing inside Mrs. Hermanson, at an angle with a bend, when a Home Depot employee came to help me. The inside-the-vehicle experiment didn’t work, but he helped me load it back up on top, and suggested running a strap down the center in front, hooking it on the hood to hold the leading edge down. Wish I’d thought of that. Wish I’d thought to tip him too. Once at home I set to work with a keyhole hand saw (I don’t own an electric saw) and managed to get what you see done by Sunday night. I’ll keep you posted on my progress, when there is some more to report. Because I know it matters to you. Oh, the Outrage! The Horror!! From our Much Ado About Nothing desk: The Higher Power of Lucky is a Newbery Award winning children’s book with at least one word to provoke dissent. This looks like the kind of thing I would not know disturbed readers if I hadn’t heard about it before reading it. You can read the details at The Publishing Contrarian. There’s certainly not the build up to Amazing Grace, the movie on William Wilberforce, as there was to The Passion, but I note one similarity. Author John Piper wrote a companion book to both films. You can read Amazing Grace in the Life of William Wilberforce in PDF at desiringgod.org. If you know about Wilberforce, you know he still speaks for our day. The fatal habit of considering Christian morals as distinct from Christian doctrines insensibly gained strength. Thus the peculiar doctrines of Christianity went more and more out of sight, and as might naturally have been expected, the moral system itself also began to wither and decay, being robbed of that which should have supplied it with life and nutriment. If you don’t know about Wilberforce (1759-1833), he is remembered for having “the grand object of [his] parliamentary existence” as the abolition of the slave trade. “If it please God to know me so far may I be the instrument of stopping such a course of wickedness and cruelty as never before disgraced a Christian country” (quoted from the preface of Piper’s book). The Presidential Prayer Team has been organizing prayer for today. They have almost 4,000 people enrolled so far. I saw a headline this morning which raised a question for me. If you could declare another U.S. president for honoring on this day or another President’s Day holiday, who would you recommend? I ask this despite my reluctance to recommend any of them. I like many of our presidents, but making holidays isn’t something I want to think about. So, I blogged it instead. I see a new president for 2009 has already been declared. Apparently, most books don’t sell well, even losing money for the publisher, so insiders keep real sales figures, if they can be known, to themselves. If an author claims his book sold 100,000, you have to trust him. There’s no public record to verify it. Judge Not Lest . . .
Here’s a book for those who think they understand Jesus’ intent behind his command to avoid judging others lest we fall under condemnation. Making Judgments Without Being Judgmental: Nurturing a Clear Mind and a Generous Heart, by Terry D. Cooper.